A phrase from Isaiah 9:2 and Matthew 4:16 has been running around in my head all month: “The people walking in darkness have seen a great light…” I have been mulling and churning over this verse for weeks. It won’t let me be. :) The challenge has become how to narrow the focus. There is so much! And it’s all sooo good. God is good. LIGHT… God created it first even before He created the sun and moon and stars. It separates. Much like the double edge sword of the Word/word of God. I haven’t been here in ages. A friend’s family member passed. The viewing was this weekend. This cemetery in Nectar, AL was just down the road from the funeral home as the proverbial crow flies. My daddy is buried there. I was 12 when he passed. Daddy worked two jobs, ran for elected office on a national level and was involved in his church and community. He was laying pipe while on his second job when the accident happened. The second job was his fledgling construction company. He was laying pipe in order to bring city water into our community. I can remember going with my mother, siblings and a car load of kids she kept to collect water at the spring when water went out at the house. Daddy was using a backhoe to dig the pipeline. He put the machine in neutral and stepped off. If he had turned the digger off it might not have happened. His pant leg caught the gear as he was descending the backhoe. This put the machine in gear and it rolled over him. I didn’t get to say my goodbyes. Over the years, I have worked on my “daddy issues”, consequently. In my twenties, I wrote him a letter. It was most freeing and healing. At his grave site there was no regret. No “if onlys” or ” might haves”, “should haves”, “could haves”, etc. There was peace. I am not sure why I went. A few memories came to mind while standing there. My Daddy was a handsome 6’3″ blue eyed man with dark hair. Seems like it was black. I was about six when my 5’5 ish grandmother looked up at him and with a pointing index finger, informed him he was not too big for her to spank. In the momentary silence which followed, I wondered what Daddy had done. Then they laughed. Whew! Daddy was off the hook. That was it…until this morning on the way to work. I was reflecting on my visit when a memory years after Daddy’s death came to mind. My sons were maybe 5 and 2. Grandmother wanted to take us all shopping. Anxiety kicked in. Two active boys were about to go shopping with their great-grandmother who didn’t understand why they might find that boring and behave accordingly. Friends and family who knew of the impending excursion called to encourage me to go and try to have a good time. New clothes put away and two exhausted boys down for a nap. I was pooped. The same family and friends called to inquire how “it” went. We all lived through “it”. Later that evening, when the boys’ dad was home, I was able to have a moment to myself and ask my heavenly Father just what that shopping trip was about. The answer came: You want a daddy. My reply: Again? Old thought patterns came flooding back. I didn’t stay too long on those old trails. My heavenly Father interrupted. Quite unapologetically. He simply said, “Call to me.” I was breathless. What if… Again he entreated, “Call to me.” Deep breath. I called. Silent tears fell. The boys’ dad was relaxing in the recliner in the den. I heard him get out of his comfortable position. I tensed. I knew if he came into the living room he would ask what was wrong. I would say nothing was wrong. He would wonder if it was something he’d done. I would say no and it would go downhill from there. Instead, he silently sat beside me and just held me. Through my sons’ father, Father God met me in my overwhelmed and exhausted state. I will always need my Abba, Papa, Daddy, Father God. How about you? Prayer is life’s breath to the Christian. It connects us to Father God in the most personal and intimate of ways. The are several ways to pray,which is for another blog. We are instructed to do so without ceasing (1 Thessalonians 5:17). Jesus and His spirit are our basis/means (Hebrews 7:25; John 16:13). Prayer is life’s blood to the Christian. It has been said, “God does nothing but, in answer to prayer.” (John Weslely). Jesus’ own instructions are not IF you pray but, WHEN (Matthew 6:5). We are further instructed to pray in our prayer closets in Matthew 6:5. After my conversation with my friend, I liken it unto the holy of holies where it’s just you and God. It is for and with an audience of one ultimately because of intimacy. In Matthew 6, the religious leaders were abusing prayer and Jesus introduced the importance of being aware and valuing to whom you are praying. He introduces what we know as the Lord’s Prayer after this teaching. So, praying privately is vital to the life of a Christian. It is foundational. And after my most recent friendly conversation, I would propose it is the first step before praying in a group. If we don’t know how to talk with God in a personal/intimate way, we just might not have any substance to draw upon when we pray in a group. The power, the fuel, the training comes one-on-one with Father. And that takes T.I.M.E. Group praying would be the other side of this coin and also important in the life of a Christian. I think of Niagara Falls. It is powerful. Even forceful. So it is when we pray with one or more in the name of Jesus in Spirit-led prayer. All those water droplets form a stream. A stream forms a river(s) and forms Niagara Falls. The power of corporate prayer, strengthened/undergirded by individual prayers, is magnified when we take a look at Heaven’s response. Worship is the 24/7 occupation in Heaven (Revelation 4). Except. Did you catch it? Worship is 24/7 in Heaven from eternity past to eternity present. It’s been going for a few eons at least. But, when it’s time to pour a full bowl of prayers of the saints back onto heaven in answered prayer…heaven growns silent. I have a suggestion. Start posting prayers on social media. But,first, search scripture for God’s heart on the matter. Then go into your personal prayer closest and craft a prayer based on the verses God places upon your heart and impresses upon your mind. Write out a prayer Then pray that prayer for several days; weeks even. Let it really marinate in your spirit, soul and body. Then gather a few folks and see how they are praying. Craft/Write that prayer and pray together for a while. Then, post that prayer on social media. Wait on God. Remain in prayer. See if John Wesley knew what he was talking about. Could it really be this simple? The meandering water cooler conversation took an interesting turn Monday. The typical discussion centers around weekend activities like sporting events, seeing family, resting, hobbies, on-going projects around the house, travel and so forth. The weekend of one compadre` captured my attention. 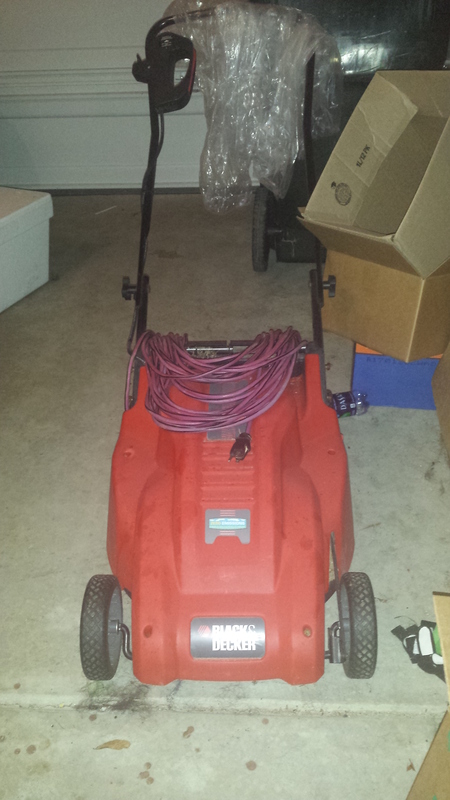 Her husband had gotten a hit on his ad offering a lawnmower for 100.00. It needed some tweaking to get it up and running again. A gentleman from several counties over arrived Saturday to investigate. After kicking around deflated wheels and other parts, they shook hands and traded phone numbers. The new owner took his mower and left. The elderly gentleman’s son was a preacher. His son adopted a young boy. As boys do; he grew. At some point, I can’t recall how, the adopted son killed his adoptive father. This man had chosen to take this child as his own. To rear this boy as his own. He signed papers. Paid money. Fed and clothed the child. Gave him a roof over his head. The preacher’s father and boy’s grandfather now visits his grandson in prison…regularly. The husband couldn’t charge the grandfather a penny after hearing that story. Later in the afternoon, the grandfather called to ask his new friend a question. Seems he needed some wisdom. The grandfather asked the husband if he thought it would be okay with God if he missed church that Sunday. Visiting hours occurred during the worship hour on Sunday. He would be allowed 15 precious minutes with his grandson. My workmate’s husband assured his new confidant the Lord wouldn’t mind. It was a divine appointment and got me thinking. How like God is that grandfather. God had a Son. Though His Son willingly gave His life for mankind (John 3:16-17), it cost the life of His Son, nevertheless. Through that death He (God) was able to reach out to us in a way which had never been possible before. He was able to extend love, compassion and mercy to us at a level which had never existed. We haven’t earned it. We don’t deserve it. Neither does that grandson. But, by the giver’s freewill these graces are extended. That grandfather’s faithfulness to demonstrate the love, compassion and mercy of God to his grandson painted a vivid picture of what God did through His Son, Jesus, for me. One last thing. The grandfather had written a YouTube address where his new buddy could find sermons by his deceased son. The link took him to a sermon on “Aha Moments”. The text was Luke 15:11-32. She’s about 40 weeks pregnant. She is as they say, “ripe with pregnancy.” It seems like a life-time ago when Gabriel made a surprise visit. The angel seemed to appear out of nowhere. Mary was stunned. Gabriel informed her she was highly favored for she had been chosen to bear the Son of God. Mary is a practical and chaste woman. How? She’s a virgin after all. Gabriel continued, she will conceive by the Holy Spirit coming upon her by the power of God. Mary is a smart girl. She is acutely aware of the shame, the condemning looks and ostracizing by family and friend soon to come. What about her finance? She knows Joseph is an honorable man. He will have every right to end their engagement. In his day, engagement was as binding as marriage. This is what God calls highly favored? At least that would have been my thought. Not Mary. Mary acquiesces. She is the Lord’s servant. As for Joesph, he has a dream. An angel appears to him and gives him the same news Gabriel gave Mary. He is to marry her. Joseph acquiesces. He is an honorable man. Before he departs, Gabriel lets Mary in on some news. Elizabeth is pregnant. Elizabeth? Barren Elizabeth is going to have a baby? At her age? Mary dashes off to Elizabeth’s for a three month visit. Mary is there for her baby’s birth. Mary returns home with a baby bump. At three months, her baby is fully formed. He has arms, legs, fingers, toes. He can open and close his mouth. Systems and organs are functioning. Fast forward forty weeks. Her baby, of questionable conception, is due any minute. He has positioned himself head first in the birth canal. It is likely her legs are cramping. She’s not sleeping well. She is plain tired. She might be experiencing contractions. It is precisely at this moment in Mary’s pregnancy she and her finance are on a seventy mile trek to his hometown to pay taxes. Joseph is likely walking. Mary is riding on the back of a donkey. This is what highly favored by God looks like? 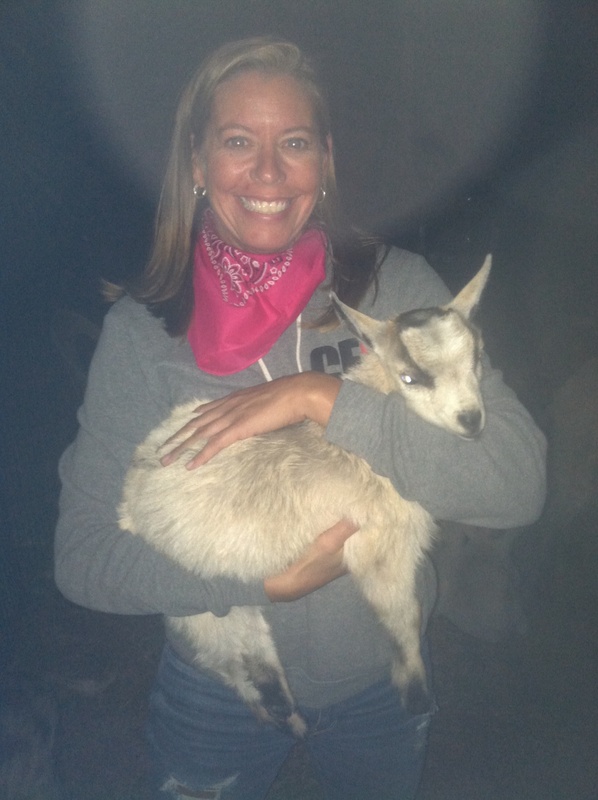 They find a manger…a cave. They find a feeding trough. Mary, with Joseph by her side, goes through labor in that cave. The umbilical cord is cut in that cave. Jesus took his first human breath in that cave. Mary snuggly wrapped her son , the Son of God, in swaddling cloths and laid him in that feeding trough. There was no room for them in Bethlehem. What about you? What about me? Are we making room for Jesus? This Christmas may our hearts be overcome with a deepening understanding of his limitless unbridled love for us.May we prepare him room out of the overflow of that love. A chain is only as strong as it’s weakest link, is an often quoted phrase which originated back in the 1700’s. It is a truism which has stood the test of time. It is one that has been marinating in my head for a while. So, of course, I had to write about it. If for no other reason than to get it off my mind. 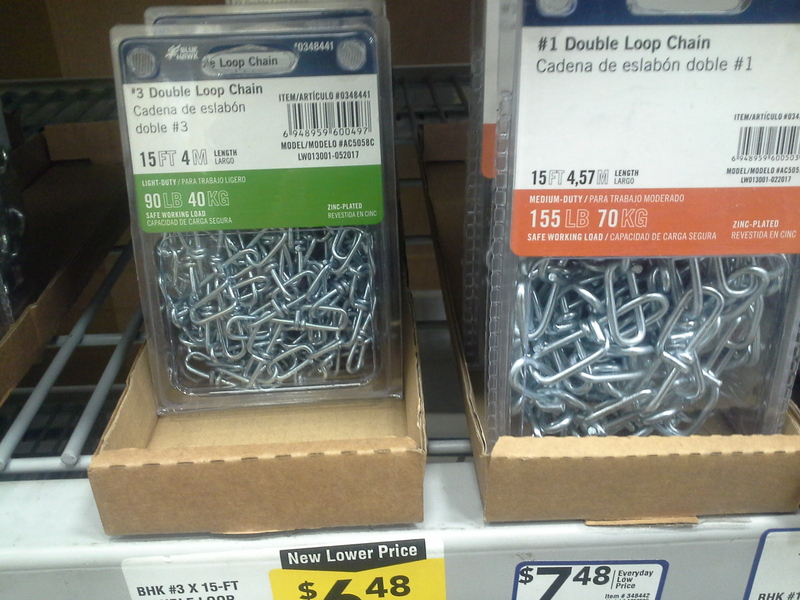 My research took me to the local Lowe’s. 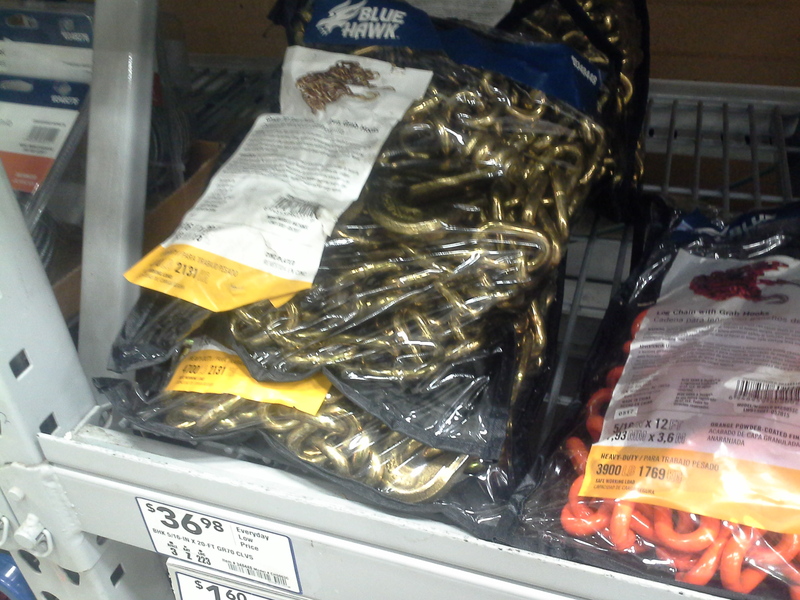 Chains come in all sizes and colors. 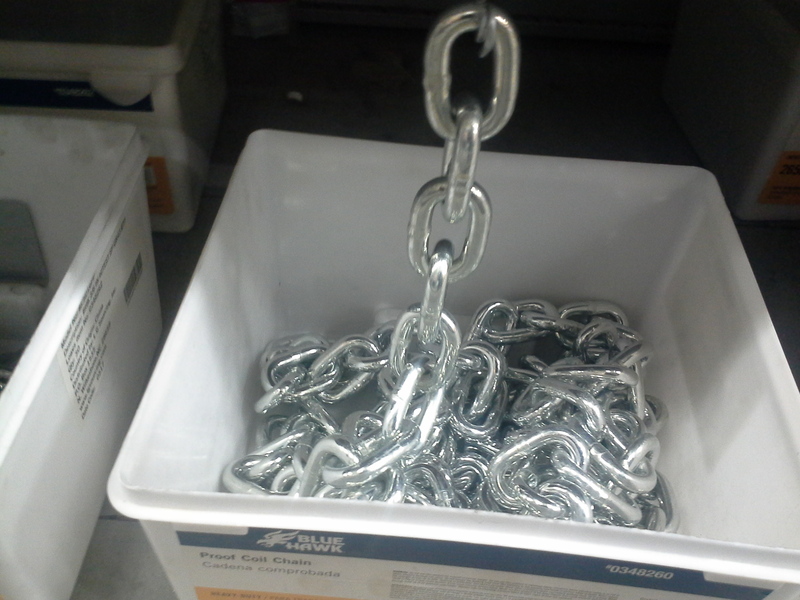 Size is not an indication of the amount of weight a chain can carry or hold. A better indication of this is if the chain has been soldered. When the links in a chain are soldered they are united/joined in a way that fuses them together without having to melt the pieces down. 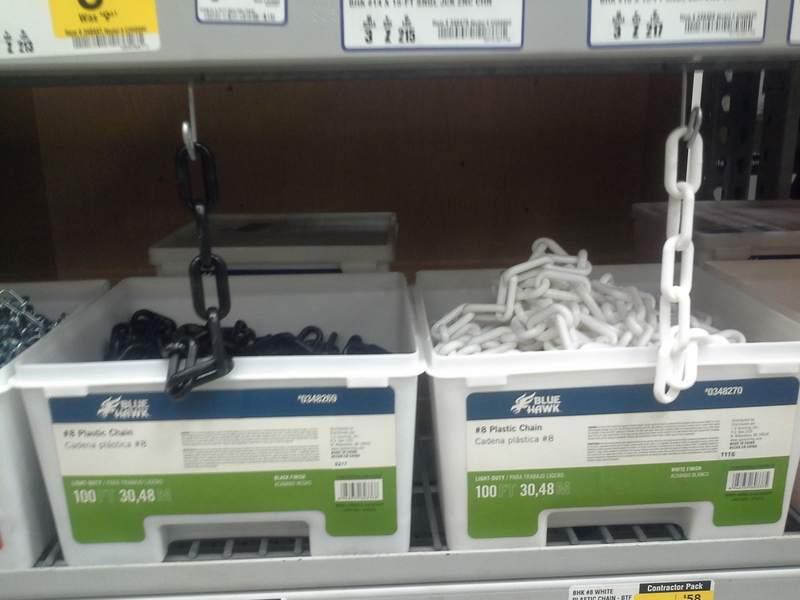 Next time you are picking up an item at your local hardware store check out the chains. See if you can tell which has been soldered and which has not. An article I read recently confirmed the aforementioned thought running through my head was indeed a topic warranting putting virtual pen to virtual paper. The author describes a normal life. One of seeing to the needs of those around them and growing in their faith sans bells, whistles and megaphones announcing all they are doing and learning. The blogger wasn’t seeking to have the spot-light on them. They weren’t developing their “future ministry”. They were attempting to be present and in the moment to minister where they were. What if a missing link weakens a chain? What if, because of the no-where-to-be-found joint, the chain itself becomes unuseful. Continuing along the twists and turns of the tracks my thoughts run on, what if the soldering of that link was incomplete? It might look sturdy, even strapping, but, when put to the test it would be found lacking, wouldn’t it? When a link goes AWOL, its absence is noted almost immediately. Its presence is integral for the chain’s purpose and function. Each coupler supports the others. The chain is strengthened when each link is present and accounted for. I am guessing you are getting the analogy. When we are missing in our communities, homes, work places and other spheres of influence our absence is felt. When we are seeking to develop “our” ministry, careers, etc. over being present where we are, our absence causes a ripple effect across all those spheres. Opportunities are missed to grow and develop not only personally but, to help others do the same. I am seeking to be present. I am finding it challenging. I know what I want and how it will look when it arrives or least … I think I do. Being present allows for sweet surprises along the way. If I am AWOL, I will regret missing those serendipitous moments. Guess how I know. How do we stay strong and present and not become the weakest link? Great question. Here’s my heart’s response: The LORD our God is One. Love the LORD your God, with all your heart, soul and mind and strength. And love your neighbor as yourself. I never was good at relationships. I had a lot to hide. I held people at a distance, afraid if they really knew me they would be disgusted, appalled, shocked and want to run. I was overly-concerned with what people were thinking about me. Looking back, I was always striving to please and give an impressive presentation of myself suitable to the person I was deceiving. I didn’t know who I was. I hated the woman I had become. When I didn’t measure up to people’s expectations or even worse, my own… I would plunge myself into condemnation. A shame so deep that it kept me in a cycle of addiction and performance for over 20 years. I couldn’t breathe. The panic and anxiety related to failure had stolen my breath. I was lifeless and looked like it. Almost two years ago, I was at that place again… Smoking, drinking, homosexual, hopeless, suicidal, addicted, lying, stealing, trying to maintain, barely surviving and completely desperate. 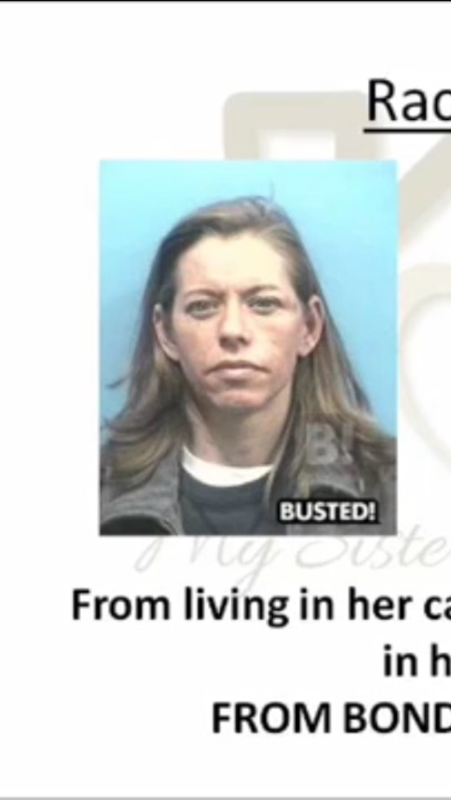 I was headed for jail or rehab again. That’s usually where I ended up. I just wanted to die. I would imagine and plan my death. I believed in God. I was raised that way. I was a Christian who couldn’t find God when I needed Him the most. I remember laying in bed night after night crying out to God, sometimes begging in desperation and sometimes mad as hell. I tried everything to get His attention. I heard in Job that if you cursed God you would die. I did. I didn’t die… at least not the way I thought I would. Down at the house, I started learning about a relationship with Jesus, the Father and the Holy Spirit. I wiped the slate clean of my mind and heart from everything I learned in Christian school, college and growing up in church. I asked the Father to teach me about His love for me. I began to die. Sometimes it was instant and sometimes it was a process. I’m still dying… it is so ugly and beautiful at the same time. I can tell you I was instantly healed from all my addictions and had no withdrawals, which is a huge miracle. The Lord started renewing my mind in His presence and with His word. We spent a lot of time on our faces, hands and knees in the living room at 6am just listening to worship music, soaking in His presence and letting Him lavish His love on me. It was different than anything I had ever heard of or tried. One morning, in His presence I had a vision of Him. The Father was holding me as a baby, probably about a year old. He had my head cradled in His hand. He was washing my hair with His other hand, and then He took a cup of water and rinsed my head. He bent down and kissed me on my forehead. Then my nose. Then right on my lips. He said, “You don’t kiss other people’s babies on the lips, only your own flesh and blood. You are mine!” That completely changed me. That was my first time getting wrecked, completely undone in His presence by His touch and voice. All of a sudden in an instant He was real and I was His. As my old self continued to be exposed in order for it to die, my true identity began to come to life. The Father started showing me how I am a precious, princess and all He wants is for us to spend time together. He relates to me. He gets me. He knows everything about me and has always been there and will be. I am in awe-struck wonder of His love for me. He has taken the limits off what He can do! I have seen Him heal mental illness, addiction and restore families that were “beyond repair”. He does miracles on a daily basis and impossible things are “normal” for me, as His beloved daughter and heir. In Florida, I have a PIN number which gives me entry into every prison in the state. I have ministered to the women on Florida’s Life Row ( death row, renamed by Dawn Adkins and the Holy Spirit). God is so good!